Young children are striving towards independence. Practical life activities help them perfect the skills they need in daily life. While learning essential life skills, they are also developing hand-eye coordination and concentration. Children are constantly exploring the world and taking in impressions through all the senses. The sensorial materials encourage children to order and classify the world they live in. These activities stimulate and develop the senses, refining the children’s powers of observation, perception and communication.They also lay the foundation for what Montessori called ‘the mathematical mind’. 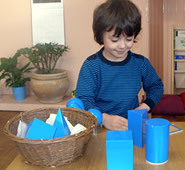 Mathematical concepts are taught through the use of tangible,concrete materials which allow children to internalize abstract ideas effectively. From the moment they enter the classroom, the children are exposed to an environment rich in language. They are prepared to read and write through a series of activities that gradually build upon all of the individual skills necessary for natural intellectual progression. Geography, history, biology, botany, zoology, art and music are explored through a hands-on approach based upon the understanding that children learn most effectively from their own experiences. Dr Montessori said, Let us give the child a version of the whole universe… and the cultural subjects are geared to this end.